Some nights I just dont want to take a whole bunch of time cooking, however I always want a good healthy dinner on the table! I dont know about you but The Dickson Home stays busy,between my 7 year old and my 3 month old sometimes I feel like a professional juggler! Last night I came up with an easy and HEALTHY dinner! 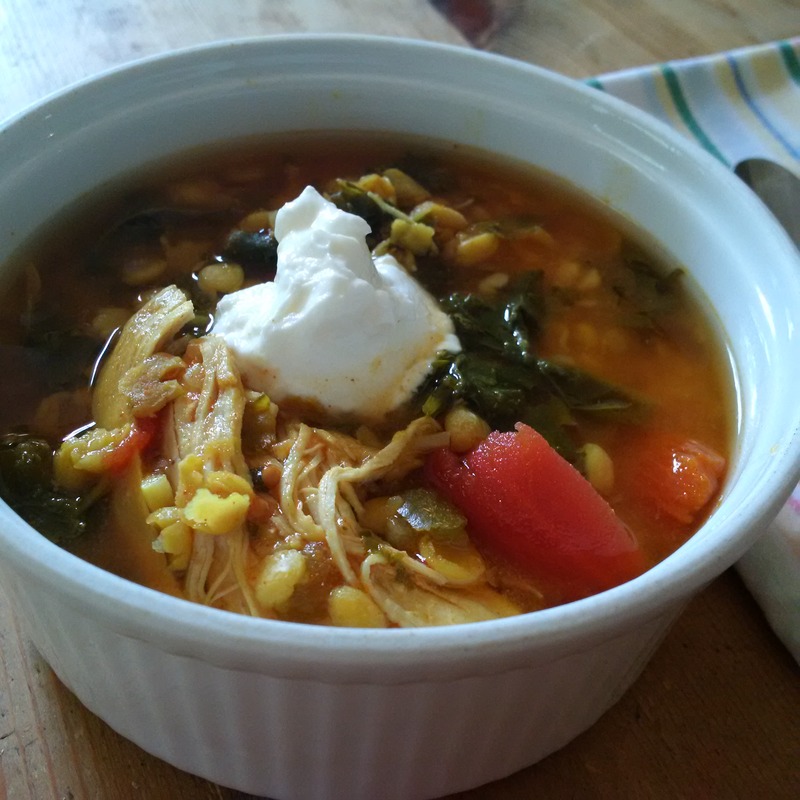 It got rave reviews from my son (who is quite possibly the pickiest eater I know)! Preheat oven to 350. Combine all ingredients in a medium size bowl & mix until spices are evenly disbursed. Next roll meat mixture into balls they should be 1 1/2 inch in diameter. 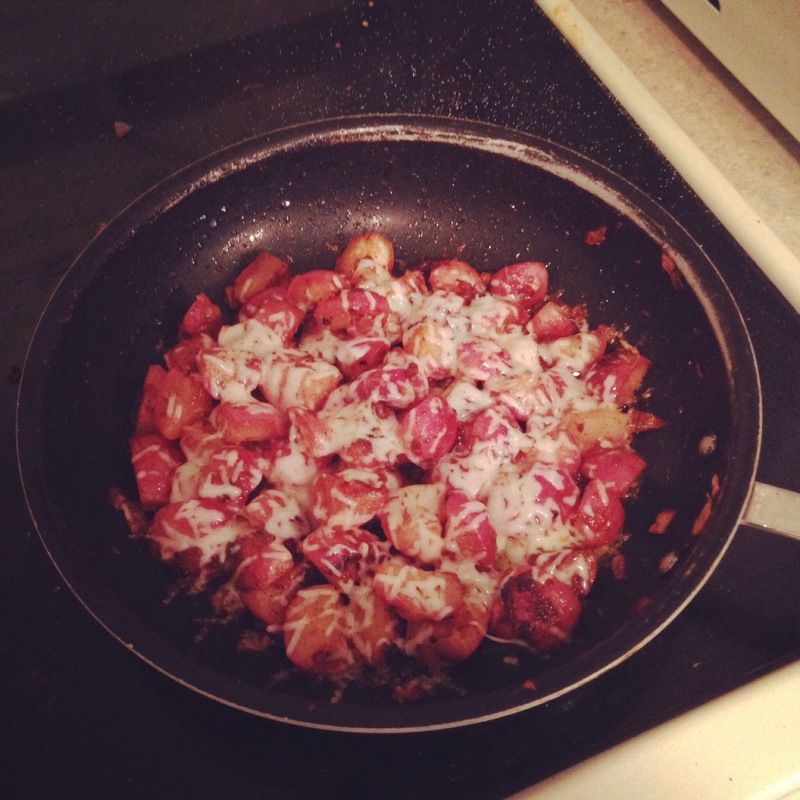 In a Medium non-stick frying pan spray with “Pam” brown meatballs on all sides. Transfer to a parchment lined baking sheet & bake at 350(f) for 20 min. I served these over brown rice with steamed veggies, but i can see using these meatballs for spaghetti & meatballs, meatball subs, meatballs and gravy, swedish meatballs… Really the possiblities are endless, They are so versatile, low fat, low carb NOT low on flavor! 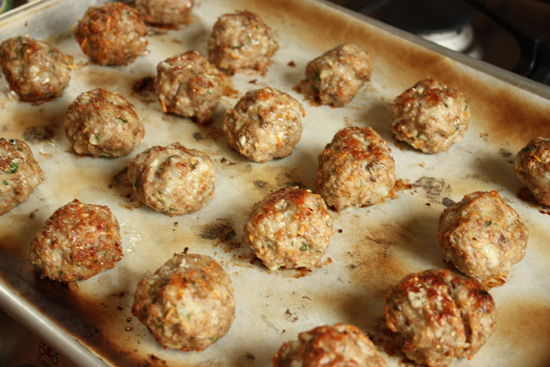 For those readers following THM these meatballs are a Fuel Pull & can be used in both S & E meals. 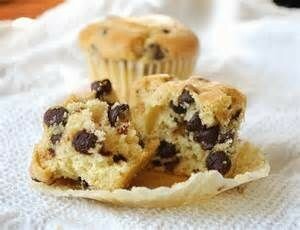 While everyone in the world is jumping on the pumpkin bandwagon , I am over here craving chocolate chip muffins! I absolute adore the Trim Healthy Mama Baking Blend of flours! The texture is light and airy like my favorite high carb muffins made with sugar and white flour. This Muffin recipe is full of protien, low glycemic, and VERY waiste line friendly. The best part? It tastes so good you will feel like you are CHEATING !! This recipe makes about 12 regular size muffinsor 24 mini muffins. They all diappear in my house too quickly to store but I would say they will last about a week in the fridge. I hope you love as much as we do, even my super picky 6 year old loves these muffins! Preheat oven to 425 degrees f. Cream together Butter, Sweet blend, eggs, vanilla, & molasses . In a seperate bowl Mix all dry ingredients and add to your butter mix a scoop at a time stirring in each time you add the dry mix. Slowly mix in the 1 cup almond milk & stir until combined then slowly stir in the chocolate chips. 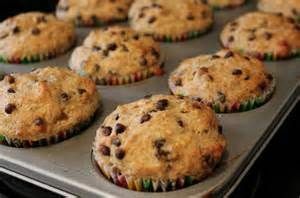 Scoop into a prepared muffin tin, and bake on 425 for 7 min lower the temperature to 375 and bake an additional 15 Min. allow to cool & enjoy!!! 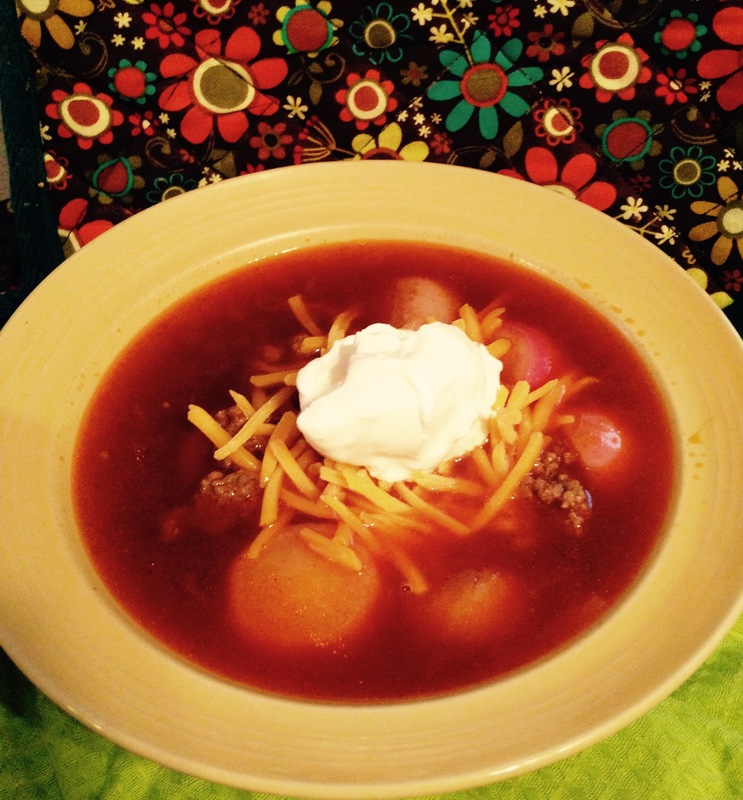 This recipe is Low Carb, Gluten Free, & A THM S or Satisfying meal. I don’t know about you, but I didn’t find many great deals on Amazon Prime day. I did wind up with an electric pressure cooker for $99! I have been eyeballing them ever since my poor crock pot crock broke. I have been trying to decide whether or not to replace the crock pot or start using an electric pressure cooker. The best thing about this new gadget is that it will replace 4 of my appliances: yogurt maker, rice cooker, crock pot, electric skillet. 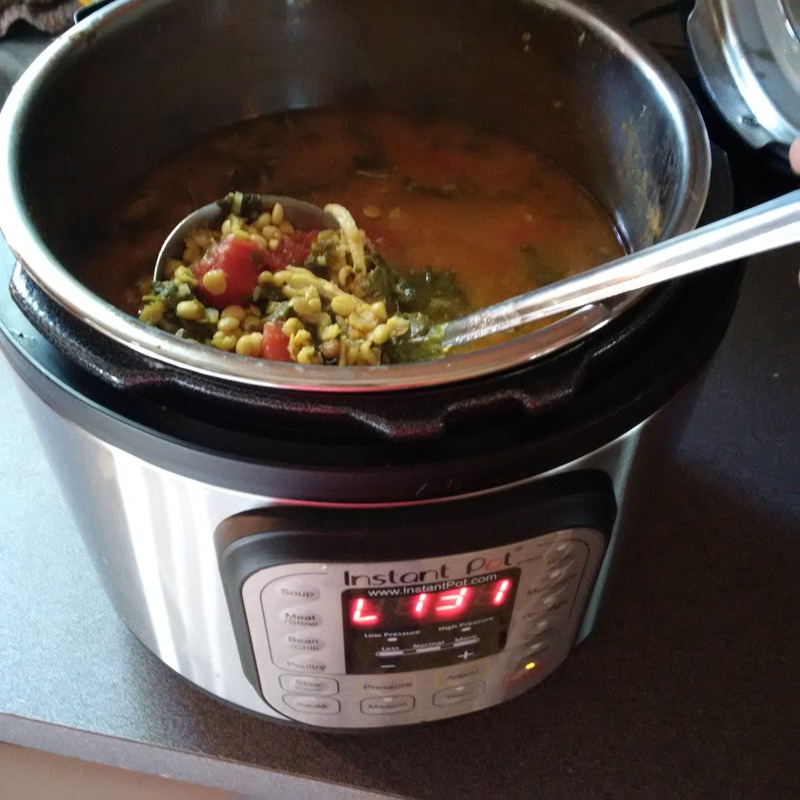 I really like the convenience of the crockpot with timer, and the speed of stove top pressure cooker. I have always owned a rice cooker because it makes the best rice and I don’t have to babysit a pot on the stove. I am curious to see how my new pressure cooker stacks up to my rice cooker. More on that later in another post. Let’s get down to business of the soup! This is one of the easiest recipes you will ever make. It only takes 1 pot, you put in all the ingredients at the same time. Perfect for working peeps and busy people alike. You can use either a crock pot, pressure cooker or stove. It is also very versatile and easily adjusts to your family’s tastes. Chana Dahl, Chicken breast(whole or ground), kale, chicken stock(optional), garlic, bay leaves, dried or fresh onion, onion powder, salt, tumeric, paprika, korma masala, mild curry powder, can of stewed tomatos and greek yogurt or fat free sour cream (optional). To start assmeble all your ingredients in the increments listed below in the recipe. The prep time literally takes me 5 min or less. 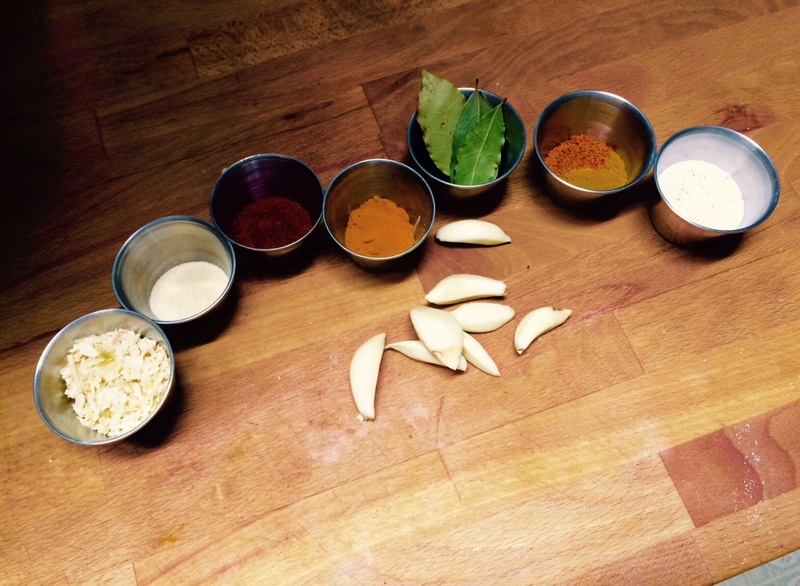 From L to R we have dried onion flakes, onion powder, paprika, tumeric, bay leaves, korma masala and mild curry, salt, and garlic cloves. Take your chicken breast and place it on the bottom of the pot. You can use fresh or frozen chicken. You can also use 97% lean ground chicken fresh or frozen, just remember to increase the cooking time if you are using frozen meat. 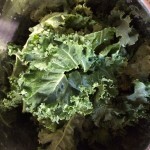 Next, put your kale( stems removed) in the pot. I don’t chop mine because it breaks down well in cooking. If you don’t have kale use any kind of greens you have on hand. I have used the power blend from Costco and we like that as well. 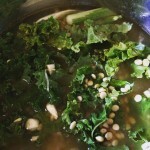 This is a great way to get greens in your meal plan. The kale will not overpower this dish especially with the curry powder in there. 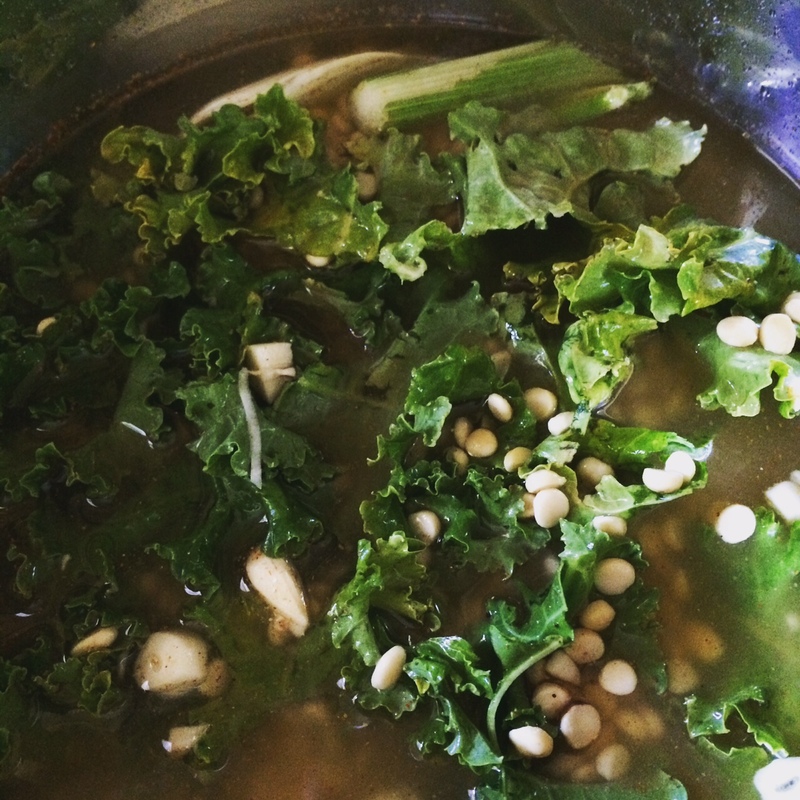 On top of the kale, dump the soaked Chana Dahl, all of the spices and salt, 4C chicken stock, and enough water to cover the contents of pot by 1/2″ to 1″ depending on how you like your soup add more or less water. We like ours kind of soupy with lots of broth. I often use left over veggies in this dish such as bell pepper, carrots, zuccinni, asparagus. Anything that I only have a small amount of hanging around. If you have a pressure cooker like I do, you will want to cook for 30-40 min on high pressure. The whole thing should take about an hour and 20 min. If you want to speed up cooking time a little, add hot broth and water. With this amount of food in the processor it takes about 30 min to bring the pot up to the temp that seals and starts cooking. Then it takes about 10-20 min for it to cool down enough to open. I wait 10 min and vent the cooker. After you open the cooker add in your can of tomatoes and stir, shredding the chicken as you stir. Serve yourself a bowl and put a dollop of greek yogurt on top YUM! This amount will feed a family of 5 with leftovers depending on how many bowls you eat. It is a hearty and cheap meal to fix. The whole thing usually costs me less than $10 for the whole pot. I have included directions for crock pot, stove top and stove top pressure cookers in the notes of the recipe card. If you don’t have all of the spices feel free to leave some out, or add a spicy curry if you like it that way. My husband likes it spicy and my kids don’t so he adds sriracha to his bowl. 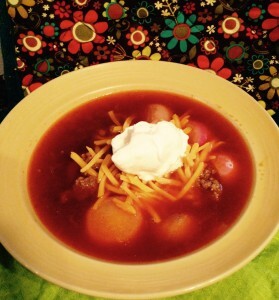 This recipe is very forgiving so feel free to make it your own by adding more or less spices. The finished product above in the pot. I hope you enjoy as much as my family! Cover and set the timer to 40 min if using frozen meat or dry beans, 30 min if using defrosted meat and soaked beans. It is hard to over cook so if unsure use longer time. Once the cooker is opened add in your can of tomatoes and stir. You are now ready to eat! Crock pot method: For soaked beans and defrosted chicken will take on average 4 hours. For dry beans and frozen chicken it takes me 6-8 hours to get the consistency where I like it. Stove top method: For soaked beans and defrosted chicken, it takes around an hour and a half to 2 hours. For frozen chicken and dry beans, almost double that. I bring my pot up to a rapid boil and then turn the burner way down to a simmer, stirring every once in a while. Stove top pressure cooker method: Same as recipe, use the pressure guide for your pressure cooker for poultry. About a month ago my sweet friend Patricia from work brought these AMAZING rosemary nuts to work, Tish is our RN and she is such a talented baker, and confection maker! I snuck in a few of these nuts knowing that they were totally off plan for Trim Healthy Mama… I felt no guilt! I simply enjoyed the delectable little confection and decided I must THM-ify (this is a new word I made up… it’s a verb of course meaning to tweak or change a recipe in a THM friendly recipe) OK enough of the English lesson according to Mel… With Tish’s genius recipe in hand i set off to work– it was pretty simple. Special thank you to Tish! 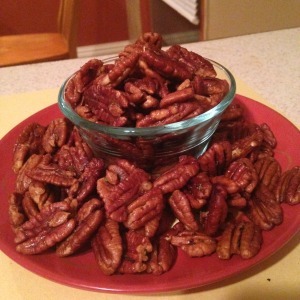 Place Pecan's in a single layer on a parchment lined cookie sheet. 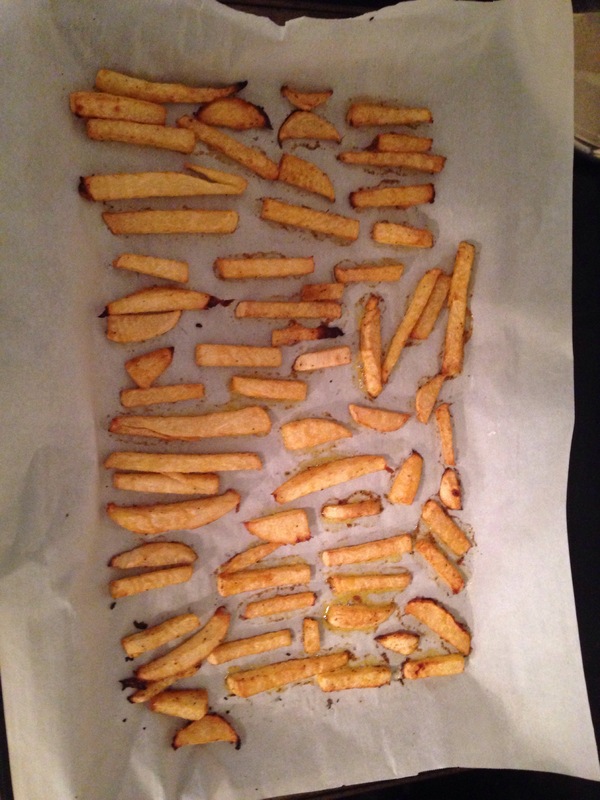 Place in oven for 8-10 minutes, don't allow them to scorch! 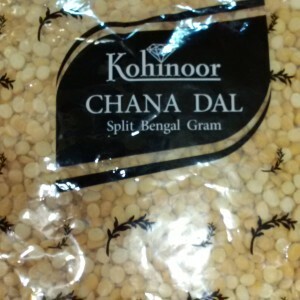 they will become very fragrant with they are ready your nose knows when they are done. While the pecan's are roasting melt butter in a pan over a low heat,then stir in your THM brown sugar, salt, and cayenne pepper until incorporated completely. When the timer goes off for the pecans toss them in a bowl and pour your glaze over them and toss until all the nuts are coated. Then toss in the finely chopped rosemary so it is evenly disbursed on the nuts. You will want to allow these to cool completely before sampling. They will keep fresh at room temp for a few days so no need to freeze or refrigerate. 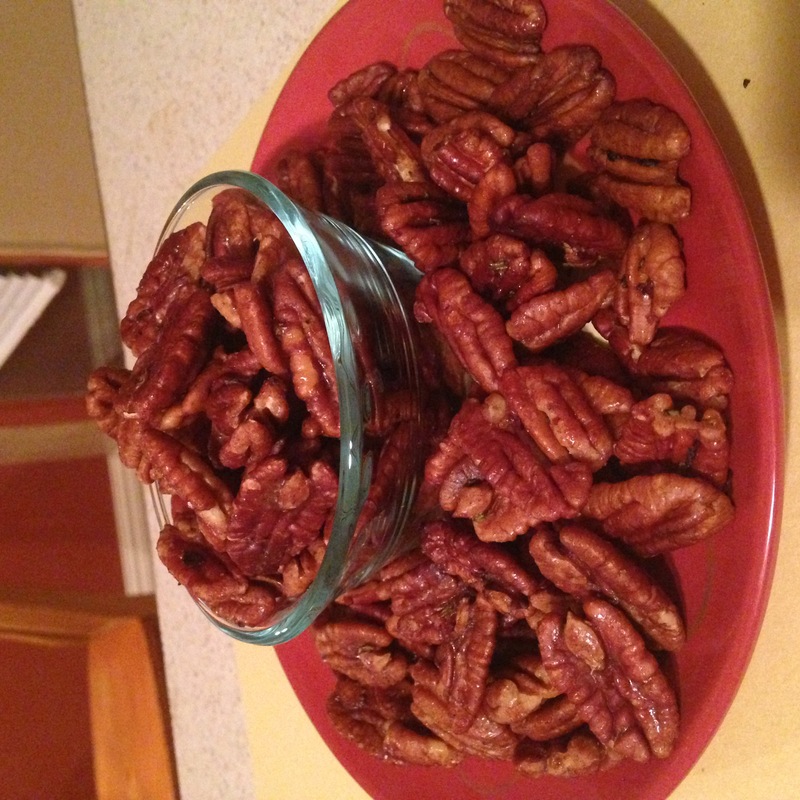 One serving is a small handful (about 8-10 pecan halves) If you are a Trim Healthy Mama like me you want to make sure to always respect your portion size in nuts because of the fairly high fat to carb ratio. We don’t to create and accidental clash of the fuels! These would make a great and simple party treat for all those holiday parties coming up, or even a great neighbor gift! Throw them in a cute baggie and tie with a bow. Pumpkin, Pumpkin, Pumpkin! Since the first week of October all i have read about is pumpkin recipes, coffee, cake, pie, bread… You name it bloggers have made it PUMPKIN! I am a little late for the pumpkin band wagon, however the last few day I have been seriously craving pumpkin pie.Buttery yummy crust, creamy pumpkin filling and delicious creamy whipped cream on top… NOM NOM NOM!!! Well last night also wanted donuts. thanks to my amazing lifestyle on Trim Healthy Mama, I can have my pie and eat my donuts too! thus the creation of Pumpkin Pie Donuts with a Cinnamon brown butter dipping glaze! is your mouth watering yet? These are packed with protein and will keep you on track all morning! 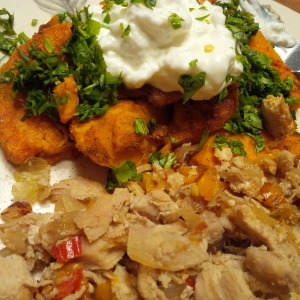 they are a THM S or Satifying meal, which means they will also work for Paleo or Low Carb! I use a mini donut maker, but you can also use a donut baking pan. There are directions for both, Enjoy! These protein packed Satisfying donuts will leave you satisfied and ready to take on the day! In a bowl cream your butter, protein powder and THM brown sugar, then add your pumpkin puree, and mix well until completely combined. Add in your three eggs mix until thoroughly incorporated. Add in your almond flour one cup at a time then add in your pumpkin pie spice, salt and baking powder mix until the mix is combined well and smooth. If you have a donut maker : Place about 1 TBS in each well of your donut maker and allow your donuts to cook easily until the ready light comes on. If using a donut pan preheat your oven to 350 . Grind or blend the Truvia or THM Sweet Blend in a blender or coffee grounder until powdered. In a small pan melt and brown 3 TBS butter, you will know it is ready when it begins to smell very fragrant and caramel-ish. Remove pan from heat and add two to three shakes of cinnamon and mix well. Then add in the powdered Truvia or sweet blend slowly until it is completely combined. Add cream 1 tsp at a time until it is nice and creamy. Allow your donuts to cool (if you can I personally burned my tongue because they smelled sooooo good!) 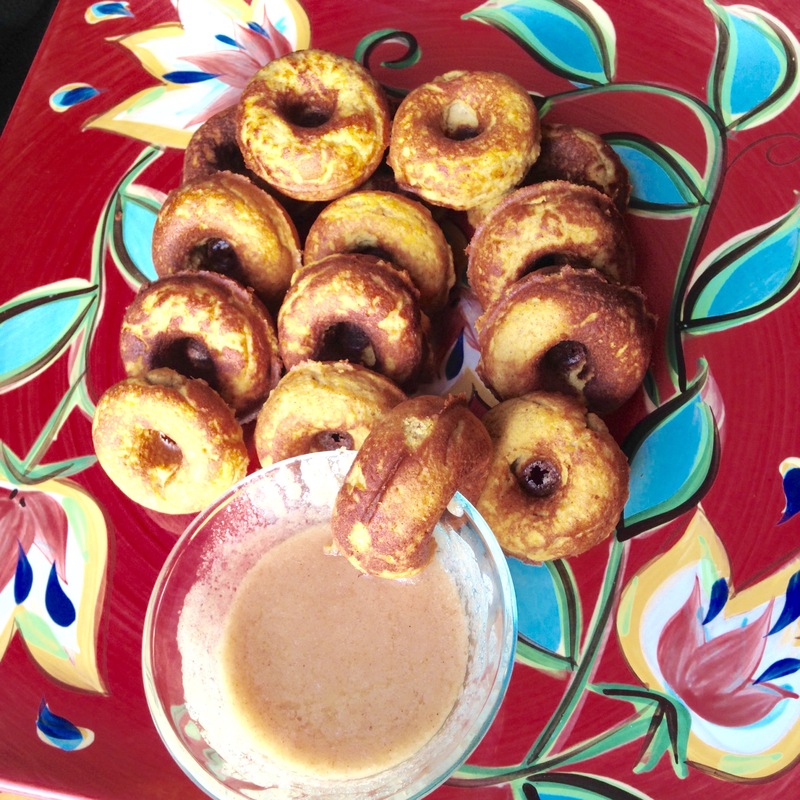 enjoy dipping these in the brown butter glaze or roll each donut in the glaze and allow it to cool before eating. This week is my third week as Trim Healthy Mama, I am eating delicious chocolate, rich foods, Coffee with cream and I get to have carbs & healthy fats (separately) as well. My second weigh in this past Saturday showed no change in my weight and since seeing those numbers I have honestly been so discouraged, I lost 12 LBS in week 1, followed the plan to the tee in week 2 what went wrong? This week I have been thinking about perspective and today my new outlook finally hit me after dinner. There are a few thing that you give up with THM processed flours, added sugar, & starchy veggies. While getting the hang of this the last few weeks I have spent a large amount of time in the kitchen cooking most of my food from scratch so that it will for sure be on plan. We took the easy way tonight and got some KFC, I asked them to order me grilled and I would make a side salad with creamy Ranch dressing to go with it. I was pretty proud of myself for putting together a decent “S” meal at KFC . Yet as I sat at the dinner table tonight with my parents and my son I was feeling sorry for myself. The 3 of them had original recipe and potato wedges (MY FAVORITE I love potato’s in every form possible they are my weakness). I sat there sulking and dutifully eating my salad and grilled chicken which by the way was absolutely yummy. Thinking to myself ugh what was I thinking giving up my precious potatoes? This is just too hard I want potatoes! When I got up from the table I thought to myself Melissa you seriously need a new perspective! You see all I have been concentrating on is loss; be it weight loss, or the loss of foods I love and found comfort in, but I have been ignoring all am I gaining with this journey! An even closer relationship with my Sister Prettier (Diana) this is by far the best “gain” of all! I know that if I can keep going with this lifestyle of eating I will continue to gain positives in my life. I also know that my weight loss will continue and my clothes sizes will continue to shrink, what i cannot do is get so wrapped up in the number on the scale that I get discouraged and give up. 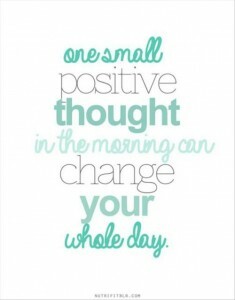 I need to continue to look at the positive and what this lifestyle has given to me. I can’t wait to reach my goals. I can’t wait to prove my doctors wrong who told me I would never get this weight off and just to accept it at 18 years old. For the first time since that day I have hope to be at a healthy weight; to be able to go shopping in a regular dress section and not be confined to the plus size section. I am excited to see the new me, body and mind.